I am always up for a challenge, especially one issued by Yuppiechef, the company responsible for most of the bling in my kitchen. 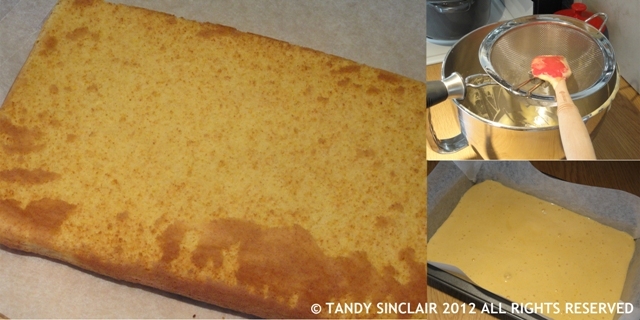 Before you can make cake pops, you have to bake a sponge cake (or buy one if you are lazy) but as a sponge cake is so easy to make I would suggest you bake your own. The next stage is to make a buttercream. And this was a real challenge for me! Buttercream is an integral part of making cake pops, and sugar free versions are not easy. I used Canderel Yellow to make my buttercream which made it very sweet indeed. 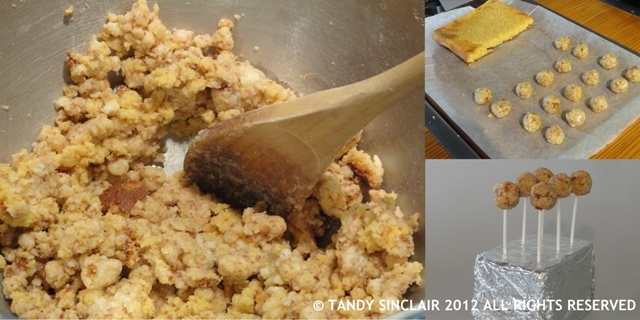 You then have to crumble up your sponge cake and mix in the buttercream. And once you have done that, roll them into little balls, push a stick in and then get them ready for the freezer. 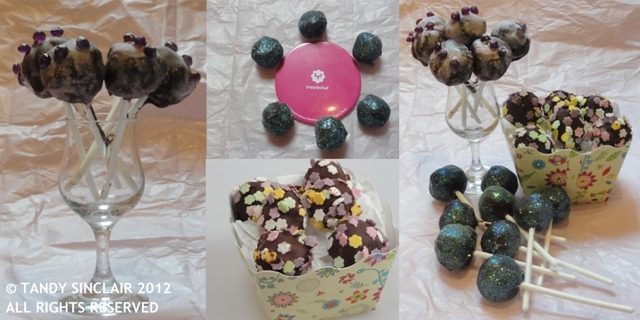 I used a simple block of florists foam covered in tin foil to hold my cake pops stable. The cake pops need to be frozen so that when you dip them into the chocolate they do not break apart. As these cake pops were very sweet I decided to use a bar of Willie’s cacao to coat them in. I reckon that kids would have a lot of fun with the decorating stage. The cake pops get covered in chocolate and while the chocolate is still warm, the decorations get added. I made some flower ones, as I love pretty flowers. And of course there had to be bling ones. My edible diamonds are not shiny at all, but the glitter certainly is. I can totally see why bakeries would make cake pops. They are a perfect use for the bits and pieces they cut off cakes to make specialty cakes for clients. I always wondered what they did with the wastage, and this is certainly the most successful use of the crumbs anyone could imagine. I have no clue how much these would cost in a bakery or shop, but a friend has offered me the opportunity to make these for her coffee shop – however, I personally think they are a lot of hard work! Not that I am worried about that, as the profit margins are HUGE even if you don’t use left overs. They are however very labour intensive and that is a challenge I don’t think I want to overcome. How do you style cake pops? 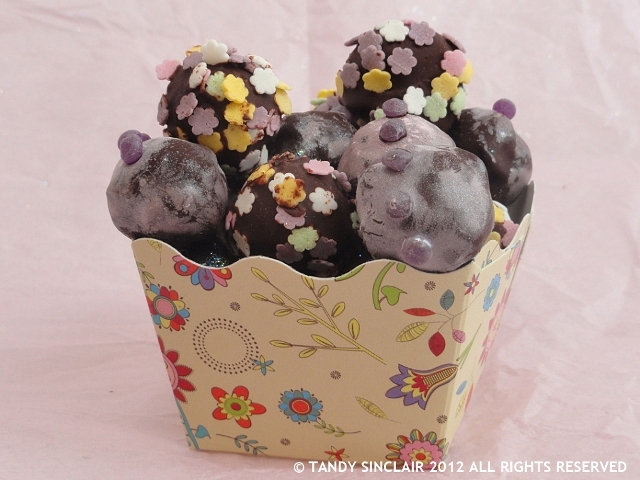 Do you think you would try making these cake pops? What a delicious and beautifull recipe. Funny as I was just talking about them again this week to a friend. I had made them last January for my eldest’s birthday- being the middle of summer they were a little melty and slidey though. I always meant to revisit when it got cooler weather, alas time disappeared. These look so fantastic T, and braces-friendly! I would try to make these.. yours turned out so pretty! Good for you, I always thought these would be complicated! It’s been awhile since I’ve made cake pops. Yours look very pretty! These look like my kind of baking as I could buy the sponge. I’m all about the decorations when it comes to my hand in baking. These look like fun. I think Tash would love these. Where did you get the lolly sticks? Cake pops are so much fun!! Super cute! These seem like they would be a fun project for kids. But very labor intensive. Gorgeous! 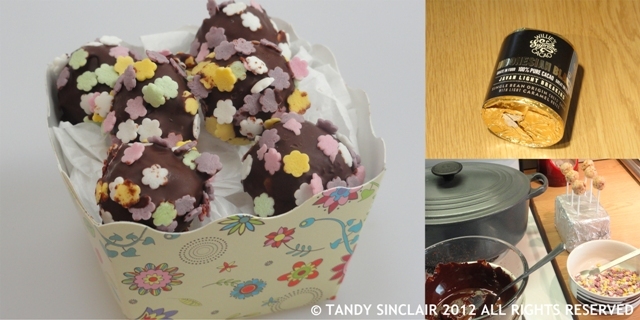 I have made some cake pops too for this challenge! SO exciting!!! Nicely done Tandy but not sure I would go this route unless for a super special occasion but still think I would stick to cupcakes. I agree, they are a lot of work, I’ll stick to cupcakes. I have been DYING to try these!!!!! Thanks for the recipe they look totally awesome! Ah, cake pops. This seasons cupcake replacement it seems – they are popping up all over the place. I hope you don’t mind me saying I am not their biggest fan. Like so often with cupcakes they are generally a triumph of decoration over flavour (although I am sure your homemade sponge is yummy) but then I am probably not the target market. I imagine kids must love them and I can totally see your point about them being useful for using up left over bits and bobs. It sounds like you made a valiant effort and the results do look fabulous. Best of luck in the competition.